130203 Which Super Junior-M Member Was the Cutest Kid? There′s something about stars′ baby photos that we just can′t get enough of, and we know we′re not alone as every time a celebrity′s past photo surfaces on the Internet, it instantly becomes a hot topic. Not even the hottest celebrities can avoid blasts from the past, and as the wildly-popular Super Junior subgroup Super Junior-M has been dominating the spotlight with its recent comeback, we′re looking back on some of the members′ more obscure days. From the deathly cute to the downright funny, we′re going way back. Try to guess who is who and, let us know which member you think was the cutest kid. 130203 SuJu’s Kyuhyun posing happily with his birthday cake! Super Junior’s maknae (youngest) is celebrating his 26th birthday today, February 3. 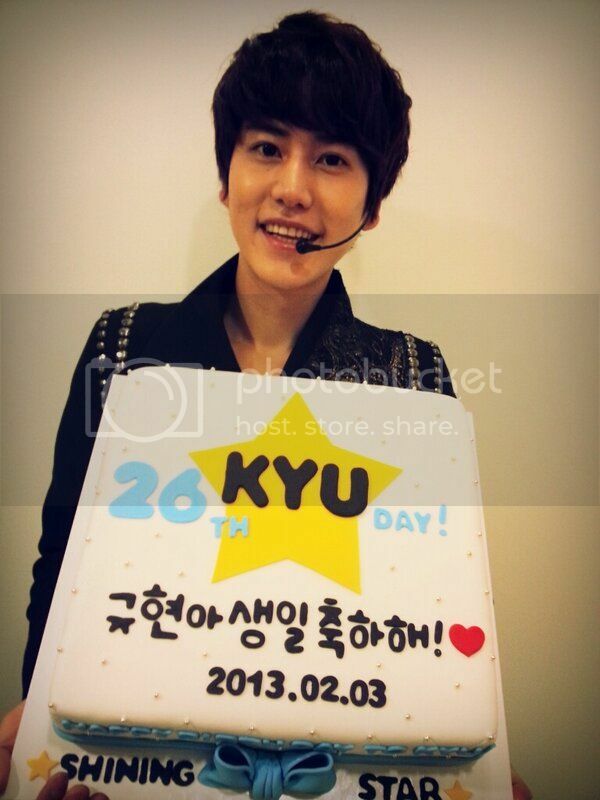 In the photo, he is holding a cute birthday cake with greetings written as ‘Kyuhyun-ah Happy Birthday!’. Super Junior’s Kyuhyun revealed a birthday cake he received from his fans.